Alexander Deans, a second year chemical engineering student at McGill University was recognized for his work with the iAid, a device to help the visually impaired move around more easily, and for a new project with Chevrolet aimed at steering teens away from distracted driving. Alexander Deans has seen the recently retired Bishop of London wear Snapchat glasses and had a private conversation with Queen Elizabeth at Buckingham Palace. Next he's considering a trip to a private island set aside for inventors. 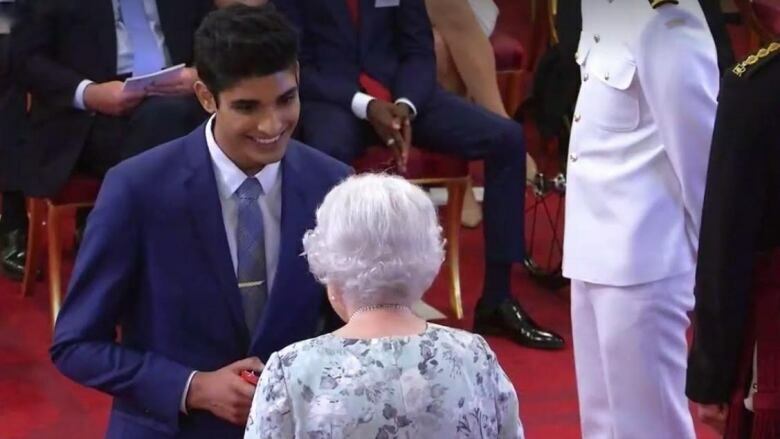 The 20-year-old was recently flown to London and granted a Queen's Young Leader Award from the queen's Diamond Jubilee Trust. "Man it was nerve-racking," he said. "She asked me about my work and congratulated me and she seemed quite interested." "It was amazing. It was probably the best experience that I've had," he said. "Mostly because of the network I now have. The 59 other young people who I know I can just call up if I visit their country and they'll take me to their homes or show me what they're working on." Deans said one of the other winners was a Paralympic swimmer and he's already looking at ways his iAid could help visually impaired swimmers and runners. "I heard from different people from different parts of the world who all have different experiences so I'm going to try to incorporate some of those different perspectives into my development of the device moving forward," he explained. The student's latest project with Chevy is still a secret. All he could say is that it will "bring celebrities and friends into the car whenever someone receives a text message." "We're really trying to appeal to young people's sense of their idols, normally celebrities or peer pressure," he said. "The hope is we can get into the cars and really show a decrease in texting and driving." Deans plans to continue juggling different projects while earning his degree, but that doesn't mean he's done brainstorming. In fact, during his visit to the United Kingdom, he received an invite from a "Swedish guy" who supports inventors by offering them stays on his private island where they can cultivate their creativity. "He flies people out there to live for a month in solitude to come up with their next creative idea," he said. "He invited me out there … so I guess that's my next tip."